The FIFA Appeal Committee has reduced Paolo Guerrero’s suspension for taking a banned substance from one year to six months, meaning the Peru international can play for his country at the 2018 World Cup Russia. The 33-year-old striker, playing at Flamengo in Brazil, got initially 12-month ban, after failed a drugs test on 5th October after a World Cup qualifying match against Argentina. Peru’s captain was tested positively with cocaine metabolite benzoylecgonine, a substance included on WADA’s 2017 Prohibited List. Pedro Fida, Guerrero’s lawyer, said the one-year punishment announced by the world forum is “absurd” and they will make appeal to that. Paolo denied ever taking cocaine and pleaded his innocence ahead of the appeal ruling, with his defense saying he drank tea contaminated with coca leaves before the Argentina qualifier. Therefore, FIFA’s statement on Wednesday read in part: “The FIFA Appeal Committee after taking into account all the circumstances of the case, in particular the degree of fault of the player, considered a six-month period of ineligibility to be a proportionate sanction. Guerrero’s ban will end at the beginning of April 2018 with the first match of the 2018 World Cup scheduled for June 14 with hosts Russia playing Saudi Arabia. However, speaking after the FIFA announcement, Guerrero’s new lawyer Bichara Neto said the player planned to appeal to the Court of Arbitration for Sport to have the six-month suspension annulled as well. FIFA’s decision to reduce the ban could meanwhile be appealed at CAS by the World Anti-Doping Agency. Peru national team led by Ricardo Gareca, qualified for the first time since 1982 to a World Cup tournament, defeating in play off New Zealand. 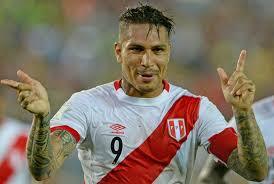 Paolo Guerrero missed this game. The ban for the Peru’s captain, will apply to all international, domestic and official games. The top scorer of Peru made his national team debut in 2004, and up to date he has collected 83 selections, scoring 32 goals.